When you own a dog, at some point in his lifetime he will feel unwell and will be sick. This is a perfectly normal way for a dog to relieve himself of unwanted food or articles, and you should not worry if your dog is sick from time to time. One thing that could cause your dog to be sick is through his interest in slugs. You may find that your dog takes to nibbling at slugs, or other creatures, in the garden; this is one habit that needs amending. The danger signs to watch out for are diarrhoea, slow body movement and your dog vomiting excessively. If your dog is vomiting on a regular basis, a quick trip to the vet is on the cards. Sickness and diarrhoea are caused by an irritation of the lining of the small and large intestines in the dog; the result is diarrhoea and constant bouts of vomiting until he regurgitates his food. But what causes a dog to be sick? A sudden change of dog food can cause vomiting, table scraps that are too rich for a dog’s intestines can also cause an upset stomach. When your dog has vomited he will try to hide it as he would in the wild. However he needs sympathy, his face washed and a bowl of fresh water for him to drink. 24 hours later you should feed him a small portion of boiled chicken or rice. If, on the following day, your dog is showing normal behaviour feed him his normal dog food in small portions. 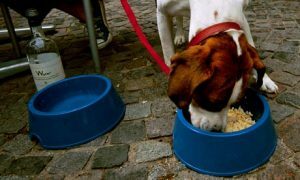 If there is more than one dog in your home, one dog may eat too fast to avoid the other dog gobbling up his food. This problem can be solved by having two separate food bowls with constant supervision.